There is something magical about that first ride across the misty Mekong from Chiang Khong in northern Thailand to Huay Xai in western Laos. There is a feeling of anticipation, an excitement of Lao soil drawing closer and all along the river signs of Mekong life. You arrive at Hauay Xai just a hundred metres or so below the immigration office (the green-roofed building in our photograph) and small queues form at the two windows as you go through the formalities. Just behind you as you queue, there's another window where you can change your money ... £200 in kips will make you feel a millionaire two and half times over. 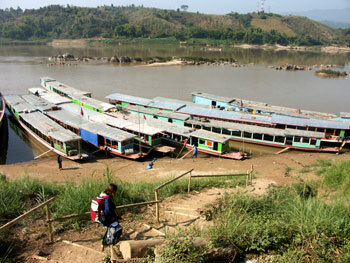 Many people go straight to the slow or fast boat moorings – but you can enjoy a couple of days in Huay Xai if you have the time and inclination. History placed Huay Xai at a crossroads centuries ago and the opening of the crossing point has renewed its position with goods going back and forth and a steady river traffic involving the Chinese boats coming down from the west. Although prosperity is catching up with Huay Xai, with many new buildings over the past few years, it is still dusty and chaotic – everything you dream about when you are planning your dry-season trip. And there are a few places of interest. Climbing up to Wat Jom Khao Manilat gives you a look at a busy temple (especially beautiful as the sun dips in the later afternoon) and, from its vantage point high above the ferry landing place (top right of our photograph above), it offers views of the Mekong and some of the town. The Shan-style temple was built nearly 130 years ago, its spectacular paintings renewed and glowing in the light. There is also a fort to see and the morning market offers the chance to purchase ... or maybe just wander around with your camera. Hilltribe villages around Huay Xai can be visited - get in the habit immediately of not taking gifts for the children and people ... there is an effort throughout Laos to help villagers to retain their traditional ways and not become corrupted by well-meaning visitors (as happened in northern Thailand). A small and discreet money gift to the head person for village facilities is acceptable. Once you have caught your breath, there are more ways to get out than just down the Mekong to Pakbeng and Luang Prabang. 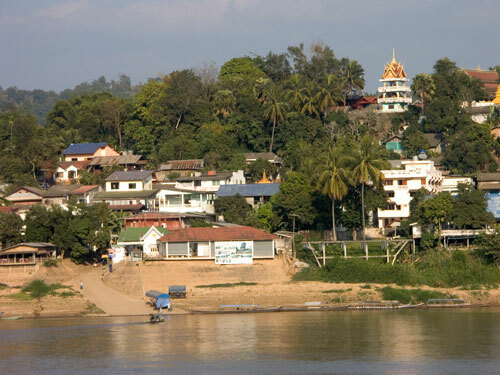 Road and smaller river connections can get you to Luang Namtha (good place for ecological tours), Muang Sing and longer journeys to the Chinese and Vietnamese border areas and to Pakbeng and Luang Prabang. The locals have learned about the moving cash stream of tourists – if you take tourist transport, expect to be crushed in and charged more. 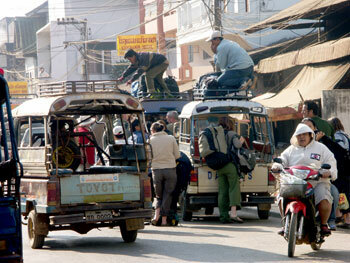 Always use the same transport as local people if you can. It can be a little more difficult and uncertain but it is more fun.